From the pits of despair in Paris, record-setting Novak Djokovic now eyes a third US Open title in New York where for the first time since Wimbledon last year, the sport's 'Big Four' will be reunited. 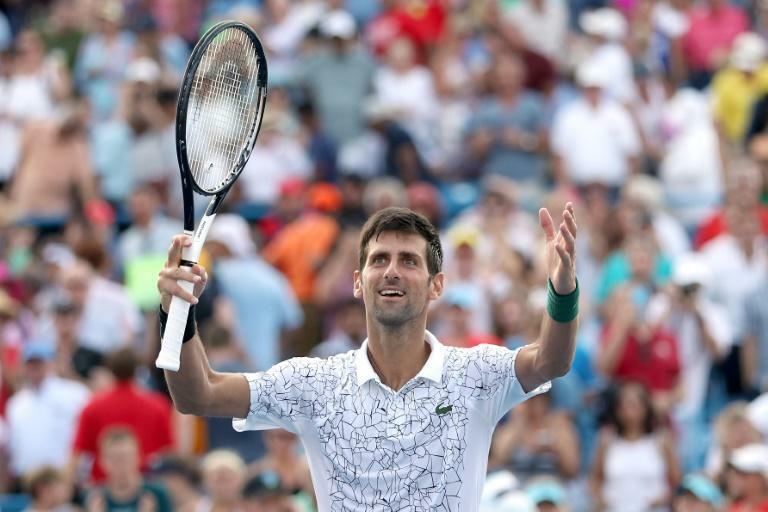 Djokovic became the first man to win all nine Masters titles with victory over Roger Federer at Cincinnati on Sunday. Having captured, against all the odds, a fourth Wimbledon in July, the 31-year-old Serb suddenly finds himself as joint-favourite with world number one Rafael Nadal to triumph at Flushing Meadows. Champion in 2011 and 2015, and a five-time runner-up, Djokovic sat out the 2017 US Open to nurse an elbow injury. His physical limitations were still evident when he slumped away from Roland Garros in June after a shock quarter-final loss to journeyman Marco Cecchinato, threatening to skip Wimbledon to mend his shattered self-confidence. Fast forward three months and Djokovic is once again the man to beat. "It's a wonderful feeling. It's been a couple of tough months for me with an injury but then winning Wimbledon and Cincinnati," Djokovic said. Djokovic's Wimbledon triumph took his Grand Slam title collection to 13, just one behind Pete Sampras. He also has 31 Masters, two back from Nadal but four more than Federer. He will head for New York buoyed by his dominance over his three major rivals as well -- he leads Nadal 27-25, Federer 24-22 and Andy Murray 25-11. "He's a great champion," said Federer in praise of Djokovic in Cincinnati. World number one Nadal, who won the US Open last year to add to his 2010 and 2013 victories, skipped Cincinnati after triumphing in Toronto the week before. The Spaniard clinched an 11th French Open in June to take his majors tally to 17 before falling to Djokovic in a five-set, 5-hour 15-minute semi-final loss at Wimbledon. "Tennis is a high-demanding sport in terms of physical effort," said 32-year-old Nadal. "I cannot forget that I am older every year." Federer also knows that the clock is ticking. The 20-time Grand Slam winner won the last of his five US Opens in 2008. Now 37, Federer would become the oldest New York champion in the Open era should he lift the trophy again on September 9 and second oldest of all time. But he was knocked out by 2009 champion Juan Martin del Potro in the quarter-finals last year having had to negotiate two five-setters in the opening rounds. Despite defending his Australian Open title in January, Federer's hopes of a ninth Wimbledon were blown apart in a five-set loss to Kevin Anderson in the quarter-finals. It was his earliest exit at the All England Club in five years. "Hopefully I have a chance after 10 years to do something special again at the US Open," said Federer. "I can't wait for the US Open to come around." Murray, the 2012 champion, is set to play his first Slam since a hip injury suffered at Wimbledon last year. His comeback has been far from smooth after spending almost a year on the sidelines and has played only seven matches since his return. The former world number one has even seen his ranking nosedive to 378 in the world -- making him Britain's eighth-best player! Outside of the 'Big Four', Del Potro, at a career-high three in the world, remains a dangerman. Amongst the widely-hyped 'Next Gen', world number four Alexander Zverev is still a work in progress. The German's run to the last-eight at the French Open this year remains his best performance at the majors while his last two visits to New York ended in a pair of second-round losses. Greek 20-year-old Stefanos Tsitsipas, at 15 in the world from 161 this time last year, is the in-form youngster. He was runner-up to Nadal in Toronto, beating four top-10 players on the way including Djokovic and Zverev. But a loss in his opener in Cincinnati proved a sobering reminder that most probably it will be either Nadal, Djokovic or Federer who will be a New York champion again this year.